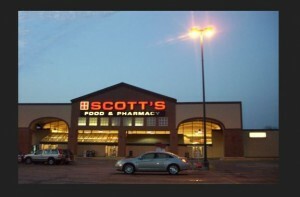 Scott’s Food and Pharmacy is a small chain of supermarkets in the state of Indiana in America. They sell a selection of products including baked goods, frozen food, meat and liquor with all stores offering pharmacy products making it a one stop shop for pain killers and pastries. In the beginning, Scott’s was a small store ran by Don Scott that first opened for trade in 1954. The store created a modest turnover for Mr. Scott, but within the decade he wanted to expand the business and make it even more profitable. In 1963, he took on a partner named Bill Reitz and they opened a chain of small stores across the northeast of Indiana. Scott’s Food and Pharmacy was a famous household name to citizens in the area, their first stop shop for groceries and medicine. In 1991 Scott’s become part of Supervalu, which is the third largest grocery retailer in the United States and stands at rank 51 in the Fortune 100 list. At this point the business consisted of 18 different stores and was later sold to the Kroger Company for a total worth of $33 million. The Kroger Company is the second largest grocery retailer in America owning multiple grocery stores and other retail establishments. The most recent piece of history with regards to the business is the company founder, Mr. Scott dying back in December 2008 after living to a ripe age of 91. Before his death, he saw five of Scott’s lower performance stores being closed down. Now the company only has 13 stores and whether more are going to open in the future is yet to be announced. The company goes by the slogan “better shopping, better prices” targeting their products at the budget shopper. The company aims to provide good quality products, a pleasant shopping experience and cheaper groceries compared to other leading grocery retails. This is a common theme with all of the chains owned by the Kroger Company.